Tired of all that Christmas shopping yet? I sure am. So why not take a moment and slow down and do your nails? 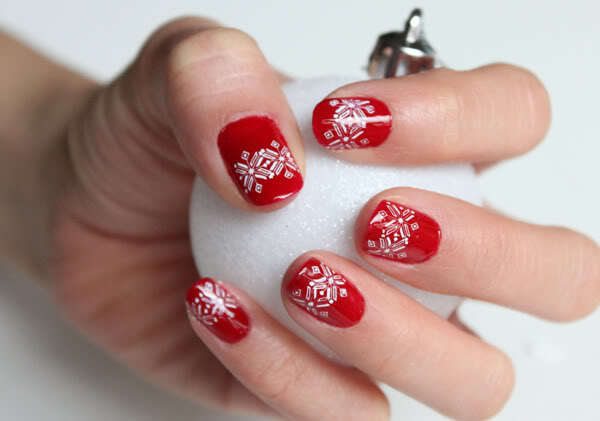 Time to be festive; today's manicure will be snowflake nails with the help of Konad of course! Here are the completed snowflake nails. Perfect for the holidays! Today we'll be using the snowflake stamp! Wait for nails to dry and prepare to be quick at stamping! This is the challenging part. Stamp second snowflake directly beside other one try place it as close as possible without overlapping the first stamp. Repeat on all nails, wait for the polish to dry completely. Apply quick dry top coat as fast as possible. If you apply top coat too slowly, it will smear the detailed Konad stamp. There you go, amazing Konad Snowflake Nails! Now you can throw on your Ugly Christmas Sweater and attend your next Family Potluck dinner! super fun where do you get a stamp like that? those konad tools are great!! !